With the London Pass and Oyster Travelcard, exploring a city needn't be like venturing into the unknown. The Oyster Travelcard takes care of all your travel needs, leaving you free to explore the city in its entirety! With free, one-time access to over 80 attractions in London, including Westminster Abbey and Shakespeare's Globe Theatre, and the option of skipping the line at attractions like the London Zoo and St Paul's Cathedral, the London Pass is literally your ticket to the city! You can use the pass for two days and avail free, one-time access to the attractions listed. Reap the benefits of big savings on both time and money with the London Pass. With the London Pass, you can you can visit any of the attractions listed for the duration of two days. You can avail the optional Oyster Travelcard to take care of all your transportation needs that includes travelling by bus, the tube, tram, DLR, London Overground, TFL Rail, Emirates Airline, River Bus services and most National Rail services in London. The pass is valid from the time it is activated at the first attraction for two days. You can visit the attractions of your choice anytime on these days. The London Pass comes with a 180+ page detailed guidebook that contains useful information including exact address details, attraction information, bus or tube line details, contact information and more. The guide is available in several languages, including English, Japanese, German, French, Italian, (simplified) Mandarin, Portuguese and Spanish. The London Pass with Oyster Travel Card is a an absolute must for any tourist in the city. Explore the city in its entirety with excellent savings on both time and money! The London Pass allows free, one-time access to over 80 attractions to the city over the course of the number of days covered by your pass. In addition to the London Pass, you can make use of the Oyster Travelcard that will take care of all your travel needs around the city. It is your public transport ticket to the city. The card, which works on a credit system, covers all London Transport networks, including the London Underground, London Buses, Dockland Light Rail (DLR) and London Overground. You can use the Oyster Travelcard at any time of day or night, which allows you to visit attractions at various times of the day comfortably. Please note, however, that using your Oyster Travelcard for the first time will not activate your London Pass. Is This Pass Good For Me? The London Pass - 2-Day Pass is worth £114.00. This a saving of almost 30%. Using the London Pass is completely hassle-free. Your pass will be emailed to you and you may choose to either take a print out of it or simply save it on your phone. You could also choose to collect your pass from the London Pass Redemption Desk on Charing Cross Road. Just show the e-ticket or physical pass at any of the designated spots at the attractions listed and enjoy swift ease of entry. Your pass is valid for up to 1 year from the date of purchase. The pass is activated when you use it at the first attraction, after which it is valid for consecutive days as specified by your choice of pass. If your credit runs out, you can always top up your card at one of the machines in the stations or by visiting one of the Transport for London ticket desks. On average, a single journey on the London Underground costs a credit of £2.40 and the bus journey costs £1.50. The savings on your travel around the city comes into play when the Travelcard stops charging you after your third journey every day, which means that your travel for the rest of the day is free. You will receive an email with your London Pass with Oyster Travelcard shortly. Please take a print out of the same and display your voucher at the redemption point mentioned in the mail in order to receive the pass. The pass will be activated after its first usage and will remain active for consecutive days depending on your choice of pass. Before you avail the benefits of the London Pass with Oyster Travelcard, you must pick it up from the London Pass Redemption Desk in central London. The desk is open all days of the week between 10 AM and 4:30 PM. The nearest underground station is Leicester Square. Take Exit 1 from Leicester Square Tube Station to Charing Cross Road and head towards Trafalgar Square. The redemption desk is opposite the Garrick Theatre. 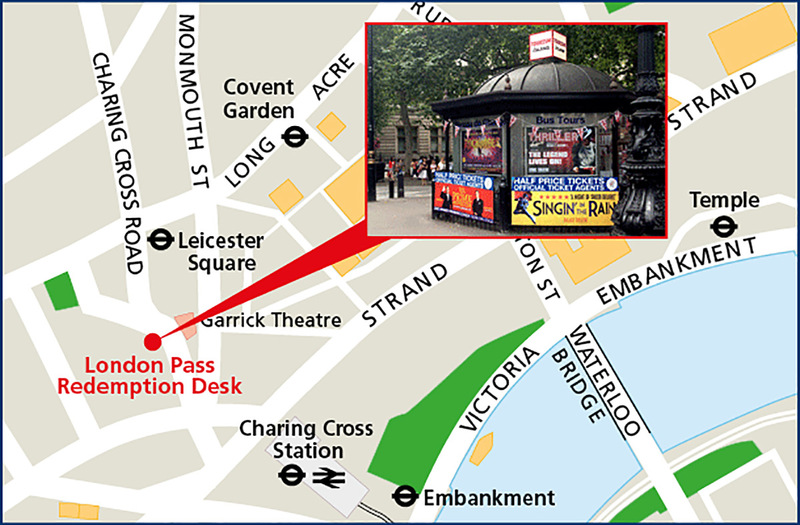 For a map to the London Pass Redemption Desk, please click here. The London Pass with Oyster Travelcard is valid for a year from the date of purchase. Your London Pass is activated when you use it at the first attraction. It is then valid for the number of days mentioned on the pass of your choice, for consecutive days and not random 24-hour periods.